Daily fast trains to/from Paris, Marseille, Lyon and more, and fast autoroute highways get you to Orange. Several fast, direct TGV trains connect Paris - Gare de Lyon and the Gare d'Orange daily in less than 3.5 hours, and even more departures are available if you change trains at Avignon, Lyon or Marseille. Orange is connected frequently to these three cities by TER regional trains. 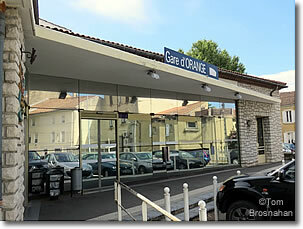 Two city bus lines run to and from the Gare d'Orange, operated by TCVO (Transports en Commun de la Ville d'Orange). Tickets cost 1€, and are for sale on board the bus. The A7 and A9, E15 and E 714 autoroutes pass just southwest of Orange, connecting it easily with Avignon, Lyon, Marseille, Montpellier and Nîmes. The N7 highway passes right along the edge of the historic center. Car parking is quite limited right in the historic center, but there's a usefully large car parking lot at the western edge of the center where the D17 and D976 routes intersect. Just north of the historic center near the Triumphal Arch and only a short walk from the Hôtel Lou Cigaloun, the Parking Sully has 160 free places. Another lot is southeast of the Roman Theater on the Cours Pourtoules by La Poste, the main post office.